A unique, castle-like hotel with versatile services in the national landscape of Imatra. Best location in the city, by Imatrankoski rapids. You’re guaranteed to feel pampered after visiting our luxurious relaxation suite. It’s easy to feel at home in our cosy, charming and historic hotel. Extensive room selection caters for all needs. Our modern, fresh and newly refurbished rooms in the park hotel building have everything you need for a good night’s sleep. In the unique rooms in the castle hotel building, you’ll sleep like a king. Some rooms have amazing views of the famous Imatrankoski rapids. Pamper yourself in the peaceful sauna and indoor pool. The comfortable saunas and jacuzzis will leave both your body and soul feeling at peace. You can exercise in the hotel fitness room and on the nearby outdoor fitness trails. The hotel houses the historic Restaurant Linnasali, as well as a relaxing lounge-like lobby bar. 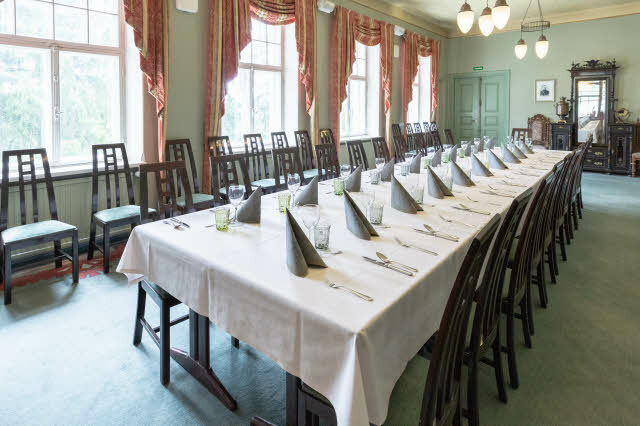 In the elegant historical setting of the hotel you can also arrange successful meetings, events and parties; our premises can accommodate up to 250 people. All areas of our hotel have free WiFi and there is a large car park free of charge. It’s easy to arrive at and leave the hotel. The city centre services are only 100 metres away, and the railway station is 3 km away. Right next to the hotel, you’ll find walking paths along the scenic Vuoksi river. The Muinaisuoma and Kruununpuisto nature trail, as well as the giant’s kettle formations, invite you to take a refreshing walk in the historic national landscape. You can also easily take a day trip to Russia across the border from Imatra. Our guests can use the hotel’s own tennis court free of charge. Relax in the warmth of the luxurious relaxation suite. The gym, infrared sauna and relaxation suite with a jacuzzi guarantee an enjoyable stay. With us you don't need to worry about parking. There’s a free outdoor car park next to the hotel. Enjoy breakfast and dinner in the hotel’s restaurant filled with historical charm. Stop by for a drink in our comfortable lobby bar. It's difficult not to feel welcome! Our hotel has 8 unique meeting, conference and event rooms for up to 250 people.